We’re outside so, guess what? It’s cold! 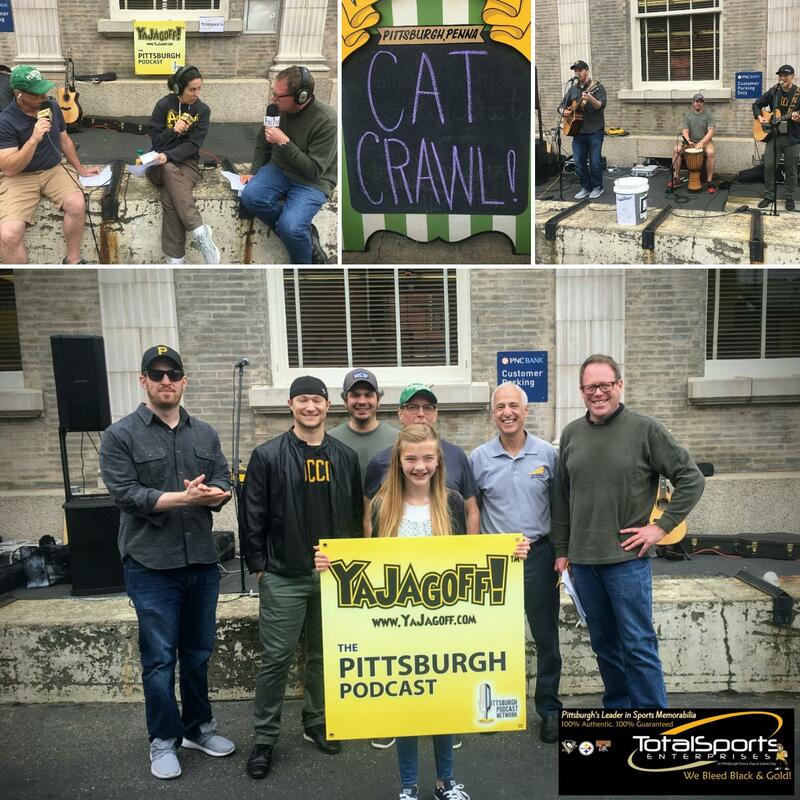 But we had a great time at the Animal Friends Cat Crawl in Lawrenceville. Dr. Paul Paris, Professor of Emergency Medicine UPMC/University Pittsburgh talks about EMS Week and Pittsburgh’s continuing influence on the EMS industry, nationally. Sophie Guest, talks about her attendance at a recent Hollywood premier of her movie, “The Good Nanny,” and the guys from TblTen talk about their “Spare Change” project in Pittsburgh. Thanks to our guest host, Professor Buzz Kill. Question of the day: If you were a cat, what would your cat name be? SPONSOR: Total Sports Enterprises is synonymous with black and gold sports merchandise from apparel to now even the flicky spinnerz that the kids love. But, did you know TSE has your choice of entertainment framed pictures from some of your favorite movies also? Watch the Cousin Lisa trivia video on FB, IG and Twitter, simply go to TSE at the Mall at Robinson, ask for cousin Lisa, give her the correct answer, and get any entertainment piece at 40% off! Make sure to shop tseshop.com. 04:50 Cassandra Dixon of Animal Friends, our hostess for the Cat Crawl, tells us what a Cat Crawl actually is! All Animal Friends info can be found at, ThinkOutsideTheCage.org. What would her cat name be? 11:15 Dr. Paul Paris has been involved in medical direction of EMS, training EMT’s, Paramedics, nurses, Emergency Medicine Physicians as well as international research. It’s National EMS Week and Pittsburgh has had, and continues to have, a strong influence on the field of EMS. Make sure you say “thank you” to your local EMS providers. Follow PEMF.net and What would his cat name be? 22:22 Sophie Guest, local child actress just had her Lifetime Channel movie, “The Good Nanny” premier. She is just home from the Hollywood premier party. Who did she wear? How does she handle all of these spooky movie roles? What about school when she making movies? What does her dad say about John’s ice-hockey skills? 35:10 Josh, Jared and Pete make up the music group, TblTen who have organized a very cool music project, SpareChange. They play pop-up shows around the town to earn donations for various non-profit organizations or individuals. Their SpareChange videos are unreal. And what would their cat names be? Follow their Facebook page or YouTube channel. 44:10 Thanks to TblTen for inviting us to be a part of the Cat Crawl and all of our guests for meeting us in the parking lot. in-your-hand, on smartphone, tablet, laptop and desktop computers.